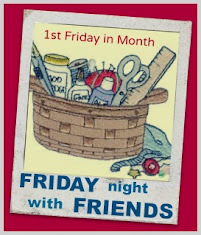 Hi, Wendy, it's ages since I've taken part in FNSI and I really need to get my crafting skates on! Looking forward to joining after missing the past few months! I will be working on the new Bonnie Hunter mysterdy that begins Friday morning. I'm so excited! Thanks 😘 Wendy, I know how busy you've been . Enjoy a relaxing Friday , love ❤️ sewing along with you. Looking forward to a productive night....hopefully. Perfect for that "secret squirrel" stuff! Yes you have been busy. I hope things settle down soon for you, and that you have a great week. Glad to see we're back on again! I'll be doing some sort of handwork or, quite possibly working on the Bonnie Hunter Mystery. Yeah, I just got it and will start my FNSI immideatly. Wish me luck, our little boy will sleep well. I have signed up, now I hope I remember to post! Great inspirational party, Wendy. Kisses!